The Guardian reports that amongst the many things that will be lost as a result of Brexit is access to free health insurance for Britons living or travelling within the European Union. In a strongly worded report on the effect of Brexit on health and social care, the committee said the challenges created by losing reciprocal health arrangements should not be underestimated. British travellers can currently use the European health insurance card (Ehic), which guarantees access to healthcare free or at a reduced cost in Europe. The EU member state providing treatment is able to claim back costs from the patient’s home country. Some estimates suggest that up to 27 million Britons have cards. The inquiry heard evidence that losing this agreement could create challenges for many travellers, including disabled people and those with mental or physical health conditions. Prof Martin McKee of the London School of Hygiene and Tropical Medicine said a week’s full private health insurance for a holiday in France for someone with a condition such as diabetes or mild depression would cost between £800 and £2,500. The report also noted that hundreds of thousands of expats living abroad could lose reciprocal healthcare rights, leaving some facing hardship. McKee, a professor of European public health, said many Britons in Spain have properties that are now worth little. “Many will come back in a state of poverty because they bought properties in Andalucía and other places ... They will be throwing themselves on the mercy of the state when they come back,” he said. It is funny how the Brexiteers never mentioned any of this during the referendum. The UK has voted to leave the EU. That fact is undisputed. What happens next is up to the UK Government and, if they are given any say at all, Parliament and perhaps the people in a second referendum. There is no mandate though for a hard Brexit or indeed any outcome other than to leave the EU. During the referendum many assurances where given to voters including that leaving the EU would provide an additional £350m a week for the NHS and that we would still be part of the single market. Both of those promises look like they will turn out to be a lie. And of course none of the Brexiteers talked about our treaty obligations, commitments that we cannot just walk away from. It is those commitments that will ensure that the EU has an upper hand in deciding the timetable for a future trade agreement. They have a right to protect their interests as well. Thus, today's Guardian tells that EU diplomats have agreed unanimously that Britain must settle its bills before embarking on trade talks. And why not? Isn't that how any divorce agreement works? As the paper says: The position has been set out by EU leaders from the German chancellor, Angela Merkel, to the EU’s chief negotiator, Michel Barnier, but this will be the toughest statement yet from all 27 countries. It is funny how none of the Brexiteers told us about this when they were campaigning to leave the EU. Yesterday's Auditor General Report on the Circuit of Wales project in Ebbw Vale underlined what a quagmire the Welsh Government has got itself caught in. As the Western Mail reports, there are some serious questions that need answering about the use of public money in this project and whether we are getting value for the investment the Welsh Government has undertaken. Further, the Auditor General said “nearly half of the total value of payments to suppliers” was conducted “with or through related parties” and invoices were approved “without evidence of value for money”. Altogether the project has received from the Welsh Government a grant of £2m and a loan underwriting facility of £7.33m, which had to be paid to the project’s bank in full in April 2016 when the company was unable to pay the loan. Economy Secretary Ken Skates is currently deciding whether to provide a further loan guarantee of £210m from public funds, without which the project will not proceed. Before any more money is poured into this project there needs to be full answers to these questions and Ministers must give us some confidence that this the circuit is deliverable and viable. At present there are real questions over whether it will ever be a going-concern. It is a long trek from allowing people to believe falsely that you lost 'close personal friends' at Hillsborough to comparing yourself to Mahatma Gandhi but it is a journey that the UKIP leader, Paul Nuttall is determined to take. According to the Independent, Mr Nuttall claims that his views are a decade ahead of our time just like the more enlightened, pacifist Indian leader. The only problem with that self-serving analysis of course is in fact, his and his party's views are actually rooted in some very old prejudices and have nothing to do with the future at all. “Ukip will lead on these and as I said in our press conference I feel as if we are a decade ahead of our time – a bit like we were a decade ahead of our time on getting out of the EU, and on mass immigration. We led the debate on those issues and we will lead on these. “It is a bit like the Gandhi thing – first they laugh at you, then they attack you, and then you win." When the party leader indulges in so many fantasies then there is hardly surprising that the latest poll puts them at 4%. Will May give in to the public demand for a debate? Does Theresa May really believe that she can control the terms on which a General Election is fought? That is the question that many broadcasters may well be asking as she continues to resist taking part in leaders' debates. Respondents were asked whether “leaders of the UK’s major political parties” should participate in the debates ahead of the 8 June general election. A total of 54 per cent said “yes”, with 25 per cent replying “no” and 21 per cent saying they did not know. Among voters planning to back each of the major political parties, there were majorities wanting the debates to go ahead in almost all. Only Conservative voters were more equivocal – but even there more believed they should happen, with 44 per cent calling for leaders to take part, and 40 per cent saying they should not. If anything this poll should encourage broadcasters to empty chair the Prime Minister. The problem with that of course is that it may come across as the opposition arguing over the scraps. Perhaps that is the point. Today's Independent reports that Theresa May is under mounting pressure to remove foreign students from the immigration figures after MPs warned that her refusal to do so is damaging Britain’s world class universities. Suggesting that Ms May is isolated on the issue, the MPs say: “There is widespread support for treating international students as temporary rather than permanent migrants: from the public, Parliament, and parts of the Government.” It highlights remarks by the Brexiteer ministers Boris Johnson and Liam Fox in favour of taking the students out of the figures. Amid Cabinet tensions over immigration, the Prime Minister may have to compromise in order to push the Higher Education and Research Bill through before Parliament is dissolved for the general election. Unless she makes concessions, the House of Lords, which voted for an amendment saying foreign students should not be treated as migrants, could block the Bill. The obsession with immigration is badly damaging higher education as well as other sectors such as the NHS. It is time the Tories woke up and acted to put this right. All parties have a moment during election campaigns when a key spokesperson goes off message, leaving spin doctors to gloss over the mistake and set things straight. It is not usual though for the party leader to undermine policy in the way that Jeremy Corbyn did yesterday. In an interview on the BBC1’s the Andrew Marr Show, Corbyn, who has been a longstanding campaigner against nuclear proliferation, said he did not believe it necessarily made the UK safer. “I want us to achieve a nuclear-free world, to adhere to the nuclear non-proliferation treaty and take part in negotiations surrounding that,” he said, stressing an immediate need to take part in talks de-escalate nuclear tensions involving North Korea. It was the second time since Theresa May announced the snap general election last week that Labour has had to clarify statements made by the leader. At this rate Labour's manifesto-writing process could prove to be an interesting tug of war. If Corbyn continues to undermine it then it may be not worth the paper it is written on. Tim Farron yesterday, positioned the Liberal Democrats as an independent force determined to fight for the country's best interests by opposing a hard Brexit, without being shackled to the interests of any other party. He insisted that both the Tories and Labour were intent on driving through a hard Brexit, which would include taking the UK out of the single market, and that his party had a duty to offer a distinct alternative, including a policy that would keep open a possibility of the UK staying in the EU. This statement finally puts to bed all the speculation about what happens after the election and allows the Liberal Democrats to concentrate on their core messages. It was billed as the Labour leader's first visit to Wales since the General Election was called but ended up mired in confusion as Corbyn's team were forced to abandon their theme for the day. As the Western Mail reported before the visit, it was understood that Corbyn was going to switch the focus of Labour’s campaign to education with a speech in Cardiff warning that too many schoolchildren are “crammed into classrooms like sardines”. That was before he was told that education in Wales was devolved to a Labour Government that has allowed class sizes to grow over the last 14 years. More to the point, schools are now the responsibility of Welsh Liberal Democrats Minister Kirsty Williams. She has just committed £36 million to reduce infant class sizes around Wales despite opposition by some Labour AMs and the Labour Council Cabinet Member in Cardiff. Having been trumped by the Welsh Liberal Democrats, Jeremy Corbyn came to Cardiff and talked about saving the pension triple lock instead. Perhaps somebody should have mentioned to him that this was introduced by a Liberal Democrat Minister as well. After all the controversy about the alleged hacking of the US Presidential election by the Russians, steps are apparently being taken to stop it happening here. The Independent reports that security measures are being put in place to prevent any attempt by Russia or other foreign powers to carry out a cyber attack during the upcoming general election. They say that the National Cyber Security Centre will coordinate the operation to safeguard Government departments as well as political parties after they asked for help. The Commons Public Accounts Committee said in a report earlier this month that a hostile foreign power may have been behind the crashing of a voter registration website in the run-up to last year’s Brexit referendum. However, the security agencies, The Independent has learned, concluded the crash was due to technical reasons. The Cabinet Office confirmed that “it was due to a spike in users just before the registration deadline. There is no evidence to suggest malign intervention”. But security sources say that there was a “pattern of acts” by foreign hackers in the run-up to the 2015 election which caused concern. The agencies have been monitoring claims of foreign propaganda and cyber activities in elections abroad since the US presidential vote. The cyber-security operation for the British election will range from offering advice to ministries, political parties and other organisations involved with the polling and ensuring they have adequate electronic security measures in place. Will the Prime Minister be empty-seated in TV debates? When she announced the General Election Theresa May was very clear that she would not be participating in any leaders debates. Presumably she has calculated that to do so would give her opponents greater credibility and exposure, a mistake Cameron made in 2010. However, whether that position is sustainable over the period of a campaign has yet to be seen. A spokesman from ITV told The Independent that the broadcaster would "hold a leaders’ debate as we did in 2010 and 2015." It will be hosted by Julie Etchingham, who chaired a similar event in 2015, with further details due to be released in due course. A source confirmed leaders had been invited, but would not say what would happen if any refused to show up. BBC head of news gathering Jonathan Munro said: "The BBC is working hard to make sure that there are leaders’ debates on the TV in the run-up to the general election because they are overwhelmingly in the public interest." There have been calls for broadcasters to "empty chair" Ms May if she does not attend, but her aides said the Prime Minister's refusal remained in place despite signals that the broadcasters may push ahead without her. Will May be empty chaired? That has to be seen. Well that deteriorated quickly. One minute we are quietly getting on with the local elections and the next we are facing a General Election a few weeks later. Parliament will vote tomorrow and it looks like the required majority will be there. However, there is still unfinished business that could derail some of the Prime Minister's plans. As the Independent reports, Conservative MPs accused of breaking election spending rules at the last election face the possibility of being prosecuted by the Crown while they are in the middle of fighting their re-election campaigns. 'The CPS is currently reviewing the evidence and considering whether to charge the MPs with breaking the election spending limits, which are put in place to prevent those with wealthy backers from gaining an unfair advantage during general elections. Update: The CPS announced on 10 May that no Conservatives will face charges for breaches of expenses rules over the 2015 general election "battle bus". The BBC report that the Crown Prosecution Service has examined files from 14 police forces and while there was evidence of inaccurate spending returns it did not "meet the test" for further action. It is still investigating the Conservative campaign in South Thanet. Technically, these contests are not called by-elections but the special election being held in Georgia's sixth congressional district could well form an important landmark in the fighback against Donald Trump. As the Independent reports, Democrat Jon Ossoff is favourite to beat all 11 Republicans in the running for Georgia's Sixth District today. The key though is whether he can secure more than 50% of the vote so as to avoid a run-off election in June when victory, with Republican support unified behind just one candidate, is likely to be tougher. All eyes will be on Georgia. If Trump and his Republicans are to be thwarted in their mission to undo all the good that Obama did then their first serious reversal could well happen there. The revelation by the Independent that EU leaders are set to strip Britain of major European agencies regarded as the bloc’s crown jewels in the early stages of the Brexit negotiations should not come as a surprise to anybody. After all many of us have been predicting such a move for some time. The paper says that diplomats on the continent agreed at a gathering last week that the European Banking Authority and the European Medicines Agency are to be relocated from London to another city in the bloc. The European Banking Authority, established in 2011, is an independent EU authority that regulates and supervises the continent’s banking sector and, combined with the European Medicines Agency, employs around 1,000 people. The European Medicines Agency began operating in 1995 and is responsible for the “scientific evaluation, supervision and safety monitoring of medicines developed by pharmaceutical companies for use in the EU”. It boasts 900 highly skilled staff and will undoubtedly create a bidding war between the EU’s member states over where its headquarters are relocated. These are high quality, well-paid jobs but this could be just the tip of a very large iceberg. Manufacturers and employers in the banking and serfvice sector are already weighing up their options and seeing how negotiations go. If we get the wrong deal then thousands more jobs could be lost to the continent. In the interests of full disclosure nobody has actually mentioned Jeremy Corbyn to me directly on the doorsteps since we started canvassing in earnest for the local elections. However that does not appear to be the case elsewhere. As the Guardian reports,on Thursday the Conservatives won a council seat in Middlesbrough, usually considered a Labour stronghold, in which Corbyn's leadership apparently featured strongly. Conservative candidate Jacob Young took the seat of Coulby Newham, with 38% of the vote, up 8.3% since 2015, while Labour saw its share fall by 8.2%, to 35.5%. The paper reports that Tom Blenkinsop, the MP for South Middlesbrough and Cleveland, whose constituency contains Coulby Newhham, suggested Corbyn’s “far left” leadership had been a factor. All of this is anecdotal of course and cannot necessarily be extrapolated across every council seat in England and Wales because of the local factors that will apply in each one. Nevertheless it does not bode well for Labour. Opinion polls show Labour still trailing badly behind the Tories whilst even more damaging is research by Opinium that finds that fewer than half of Labour voters think Jeremy Corbyn would be the best prime minister. The poll for the Observer also finds the Conservatives remain the most trusted party on all key issues except the NHS and suggests that given a two-way choice between Corbyn and Theresa May, 14% of voters would choose the Labour leader, compared with 47% for the prime minister. Other polls have found that some of Corbyn's policy initiatives such as raising the minimum wage to £10 a hour are very popular. In effect we can read what we like into their findings. The poll that really matters at the moment is on 4th May when people go and cast a vote in the privacy of the ballot box. Maybe then we will have a better idea of how the Corbyn effect is playing out across the country. The biggest impact of the Tory Party's obsession with cutting immigration has always been in the higher education sector, with many foreign students being out off coming to UK Universities because of visa restrictions. That, in turn has hit the finances of many Higher Education Institutions. It is no surprise therefore to read in the Independent that Theresa May is facing a damaging Commons revolt next week by Conservative MPs who are pressing her to remove foreign students from the immigration figures. By 313 votes to 219, peers agreed that no student “should be treated for public policy purposes as a long-term migrant to the UK for the duration of their studies”. Tory whips are trying to contain the revolt, pleading with the party’s MPs not to “rock the boat now” and urging them to defeat the Lords amendment. But rebels claim they can overturn the Government’s majority of 17, which would require nine Tories to defy Ms May if all opposition party MPs join forces with them. They hope the real prospect of defeat will force the Prime Minister to compromise. The backbench revolt leaves Ms May increasingly isolated on the issue. Downing Street has slapped down ministers who have called publicly for foreign students to be removed from the immigration statistics. Amid claims that they feel unwelcome, the number dropped by 41,000 in the year to September. There are fears that, if the trend continues, universities would have to raise tuition fees above the £9,250-a-year ceiling taking effect this autumn. Critics claim Ms May wants to drive down the number of overseas students to help her hit the Government’s target to reduce net migration below 100,000 a year. Excluding the students would make that easier to achieve. Some 134,000 foreigners came to Britain to study in the 12 months to last September, during which net migration totalled 273,000. The Prime Minister's focus on immigration has the potential to unbalance the economy, with sectors such as health dependent on a migrant workforce. However, the most damage is being done to higher education. Tory MPs have the opportunity to do something about that next week. Over at Buzzfeed the site alleges that a company run by a senior UKIP politician is selling what appears to be industrial-strength bleach as a health product, with instructions for users to put a few drops of it in drinks or use it with water as mouthwash. Its leaflet describes it as “good for you” and “the healthier element” – it says it "harness[es] the powerful healing properties of oxygen for use within the body". The Western Mail and other Welsh media have recently been focussing on the amount of money local councils on this side of Offas Dyke pay to their senior executives. They say that 107 people in Wales enjoyed remuneration in excess of £100,000 in 2015-16, compared to 105 a year earlier. Across the UK, more than 2,300 council employees earned above this threshold. Thirty people in Welsh councils had remuneration packages of more than £150,000, including four in Cardiff, three in Caerphilly and Wrexham, and two in Anglesey and Swansea. It is of course absolutely right that councils are scrutinised to ensure that they provide value for money and that as public bodies they set a good example on remuneration rates. What nobody seems to be asking though is why it is that over 100 people in Wales are paid so much. I think all councils in Wales have carried out massive money-saving measures in recent years. That almost invariably involves slimming down management in an effort to preserve front line services. Whole tiers of management have disappeared in councils across Wales placing much more responsibility on the few that remain. Those surviving managers also have a much greater strategic role than previously. Councils have to compete in the market place for high quality staff, which means paying an attractive rate of pay for what are now significant jobs. The key here though is to look at the total cost. Despite having so many managers on high salaries, wage bills have shrunk significantly in real terms. Councils may be paying a premium but they are doing so for fewer managers who are carrying out work that was previously done by a much larger cohort. It may or may not be true that history repeats itself. What is certainly true is that the world is a much dangerous place when it is led by men and women who do not understand the past and are unable to draw lessons from it. Even worse is those who try to make historical comparisons without actually knowing or understanding the events they are alluding to. It was not just the failure to understand the use of gas in concentration camps but also the claim that Hitler was not gassing his own people. In fact many of those who died in this way were Germans. It was not just the victims of the chemical attack in Syria who were innocent but those who died and suffered in the holocaust were also innocents. If you don't understand history, then not only do you cause offense in this way but you are in danger of blundering into catastrophic mistakes that could cost thousands of lives. It is worrying that the Trump White House is so ignorant of the past. I am a bit slow on this one but have decided to comment because the row does not appear to be going away anytime soon. Yesterday's Independent reports that a UKIP councillor who blamed problems faced by the NHS on female doctors has defended his comments, calling the high number of women in medical training a “major problem”. They say that Nigel Pearson distributed a leaflet that claimed a nationwide shortage of doctors was caused by “positive discrimination in favour of women”, who are more likely to work part-time. The leaflet, produced by Mr Pearson and other Ukip candidates in an upcoming Somerset County Council election, said: “Do we need female doctors? Of course we do, but not so many that they create the sort of problems the NHS is facing now”. When even the official UKIP spokesperson describes a view as eccentric you know that you have entered the twilight zone. I would suggest that UKIP get a grip except I am not sure what exactly that would involve as in policy terms they are totally dysfunctional. 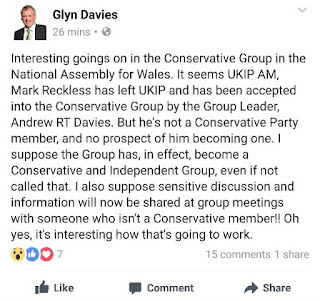 It would be fair to say that the decision by former UKIP AM, Mark Reckless to sit as an Independent within the Welsh Assembly Tory group has not been met with unanimous praise within the Welsh Conservatives or amongst Tory MPs. One would have expected though that the group which apparently welcomed Reckless with open arms would be more receptive. Apparently not. As the BBC reports, over the weekend one of those AMs publicly broke ranks. Monmouth AM Nick Ramsay went onto Radio Wales yesterday and asked: "Am I a member of a Welsh Conservative group or am I a member of some kind of hybrid independent group?" Speaking on BBC Radio Wales' Sunday Supplement programme, Mr Ramsay said: "It has raised as many questions as it has answered and from my point of view, I think we need clarification on this because I think confusion will otherwise arise. "We now have a member in the Conservative group who is not a member of the party - now that is a strange situation." Contradicting what his party leader earlier insisted, Mr Ramsay said the party's constitution "had to have been suspended in some shape or manner". 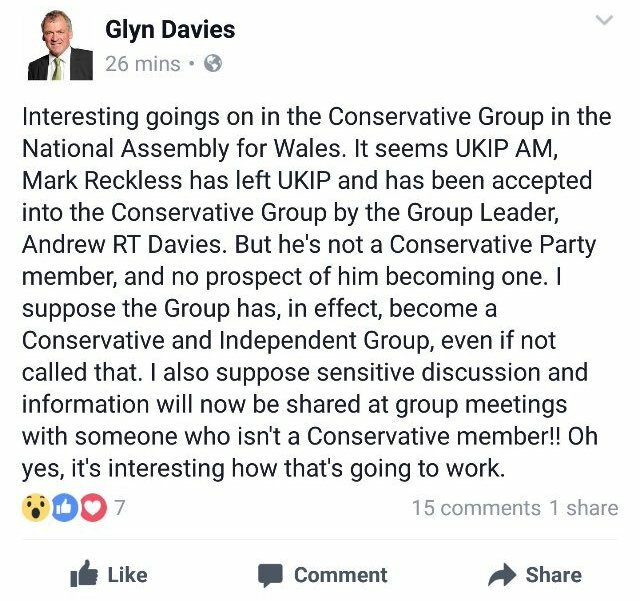 He also said a Wales Office minister would not be willing to meet with the Welsh Conservative group with Mr Reckless in it. Mr Ramsay also raised concerns about the impact this would have on the party at the polls: "Are we a Welsh Conservative group that can go into a future assembly election and campaign on one united platform? Clearly that is not the case. In going public in this way Nick Ramsey effectively contradicted his leader's earlier statement that there was "unanimous agreement" among his group "that Mark was a fit and proper person to vote with and work with the Conservative group in the assembly". Whilst the rest of us suffer price hikes due to the impact of Brexit on the exchange rates, it seems that MPs are immune, but no more. The Independent reports that MPs and their staff are facing price hikes for food and drink served in Parliament’s canteens, restaurants and bars, following a sharp fall in the Pound due to the Brexit vote. Like many British eateries, Parliament sources some of its food and drink from suppliers abroad and the fall in the pound from a high of $1.59 in 2015 to a low of just $1.20 after the referendum has pushed up costs. The parliamentary price rise is reflective of trends in the wider economy, which has seen inflation jump 0.5 per cent between January and February this year. The Office for National Statistics said food prices were the biggest driver of the price surge, with analysts blaming a time-lagged weak pound for higher import costs. Mothercare was the latest retailer to announce a post-Brexit price rise on Friday, with the maternity retailer announcing a 5 per cent hike for clothing and toys this summer. The food sector is one of those most keenly hit by the Sterling crash because nearly half of all food consumed in the UK is imported. A recent survey conducted by MySupermarket found significant price rises in a range of leading supermarkets including Morrisons, Tesco, Sainsbury’s and Asda. It is worth noting of course that Parliament’s numerous eateries serve around 13,000 pass-holders and their guests, as well as visiting members of the public and remain heavily subsidised by taxpayers. Isn't it time that subsidy was reviewed as well? Could Brexit signal the end of cheap holidays abroad? There in the category of 'I told you so' is the warning by Ryanair that it will have to halt flights from the UK for “weeks or months” if Theresa May does not seal an early bilateral Brexit deal on international aviation. The Guardian reports that the company’s chief financial officer, Neil Sorahan believes that the suspension of flights from Stansted and other airports is “a very distinct possibility”. He added: “In the worst-case scenario there will be no flights in or out of the UK to Europe for a period, for all carriers. As the papers says, Ryanair, a Dublin-based company, is legally allowed to operate out of the UK under a Europe-wide “open skies” regulation that allows all EU airlines and others in the “common travel area” including Morocco, Iceland, Norway and Switzerland to fly in and out of any country signed up to the pact. But Sorahan said that even if May changed her stance, Ryanair had to make contingency plans as the EU had said there could be no Brexit deal until all parts of the arrangement were agreed. “Europe has been very clear in recent days that no deals are going to be put in place, they are not planning to put any special deals in place,” he said. That could leave a lot of holiday makers stranded at home, not quite what we were told by the Brexiteers when they sold this pup to the British electorate. Yesterday's decision by Mark Reckless AM to leave the UKIP group and sit within the Conservative Group as an Independent has had consequences, not least for the Tories. The UK Conservative source told BBC Wales: "This is viewed very seriously indeed in London. "Every member of that group who voted to suspend the constitution has put their position in jeopardy. "Do not imagine for a moment that the party in London will roll over on this." The source also said that many rank and file Conservatives were still furious at Mr Reckless for defecting from the party in such a high profile way in 2014 on the eve of a pre-election party conference and had campaigned against him in a resulting by-election. A second Conservative source told BBC Wales: "The entire Welsh Conservative group is facing de-selection." The prospective defection of South Wales East AM and former UKIP MP, Mark Reckless to sit as an Independent is a major blow for the UKIP group in the Welsh Assembly, far more so than their estrangement with the party's former Welsh leader, Nathan Gill. The BBC report that Reckless is set to quit his latest party and vote with the Conservative group in the Assembly. However, speculation that this will make the Tories the main opposition are premature as Reckless will sit as an AM and not as yet, formally join the Tory group. Mark Reckless of course, was very close to UKIP's former only MP, Douglas Carswell. He worked for Carswell part-time and presumably this defection will enable him to continue with that work if both parties wish it. However, his departure is a major blow for the UKIP group. Reckless was effectively leader, Neil Hamilton's right-hand man. He chaired an Assembly Committee as UKIP's nominee, served on the Assembly's Business Committee, was the go-to man for procedural issues and was the obvious choice for special projects such as the Presiding Officer's reference group on constitutional change, on which I also serve. There is nobody else of any comparable calibre within the UKIP group and his departure leaves Hamilton isolated, surrounded by a rag bag of eccentrics and nonentiies, leading a declining party who could barely scrape together enough local council candidates to fill a small room, 80 for 1,200 vacancies. Does Brexit mean a lowering of our standards abroad? The Brexiteers have been very clear that once we leave the EU then the UK is going to have to get out and negotiate a lot of trade deals to make up for the lost business. Whether those deals will compensate us for what we have lost is a moot point, but still it is nice to see Ministers out and about trying to put their words into action. Or is it? According to the Guardian, UK Trade Minister, Liam Fox has been in the Philippines, where he has proclaimed that the UK has “shared values” with Rodrigo Duterte, the Philippines leader whose war on drugs has killed 7,000 people. Theresa May is in Saudi Arabia where she has refused to criticise the government’s bombardment of Yemen, which is estimated to have killed more than 10,000 civilians and displaced more than 3 million people. Liam Fox and Theresa May may have found shared values with these regimes but they should not impose that burden on the rest of us. In this case it really is 'Not in my name'. In 1739 Britain went to war with Spain on the pretext of a slight caused eight years earlier when a British Merchant ship Captain, Robert Jenkins lost his ear after Spanish coastguards boarded his ship. There is no evidence that the ear was exhibited before the British Parliament, but I suspect that if Michael Howard had been around at that time he would have brandished it (or one very like it) at the despatch box. Those of is arguing to stay in the European Union often made the point that it has guaranteed over sixty years of peace in Europe. Within days of the UK serving notice to leave the EU, a former Home Secretary and past leader of the opposition is advocating gun boat diplomacy and a declaration of war on one of our NATO allies over tabloid scaremongering. Nick Clegg tweeted earlier this week that he had vetoed David Cameron's suggestion that Michael Howard be made a European Commissioner. Strike one to Nick Clegg in the service to humanity stakes. I am astonished that such a senior politician should jump on this particular bandwagon in such a way. And I am not the only one. The Independent reports that Peter Felstead, editor of Jane’s Defence Weekly, has told them that however tense Brexit negotiations got, Britain and Spain going to war over Gibraltar was something “that is just not going to happen”. Brexiteers like Michael Howard have created the situation whereby the future of Gibralter is open to question once more. They only have themselves to blame. I don't believe for one moment though that it will become an issue in talks. What is more interesting is Spain's response. They announced that they would not veto an independent Scotland joining the EU. Now that really has opened Pandora's box and yes it was the Brexiteers who handed over the key. Are UKIP AMs missing in action? The latest controversy surrounding North Wales UKIP AM, Michelle Brown involves attempts by her regional party to deselect her. The letter, written by Shaun Owen, vice chairman of the UKIP Delyn branch "on behalf of UKIP members in north Wales", says there is a "deep sense of growing disquiet, disillusionment and alarm" amongst members regarding Ms Brown's conduct. It lists 18 concerns, including an accusation by a Cardiff hotel that the UKIP AM for north Wales smoked "recreational drugs" in her bedroom. Ms Brown's spokesman has denied the allegation, saying the "strong smell" in her room was caused by a strong tobacco product. Details of discussions between Ms Brown and an assembly official concerning how an advert for a job in her office could be changed to help her brother get an interview for the post, are included in the letter. Michelle Brown has said she acted with "complete propriety" in the matter. Mr Owen also cites a property leased by Michelle Brown to act as her regional office that has never been opened. Responding to a Freedom of Information request by BBC Wales, the Welsh Assembly said it had paid £2,027.93 for the property between October 2016 and March 2017. The assembly said the office in Shotton, Flintshire was not occupied "because work necessary to ensure its security was carried out incorrectly". Mr Owen said the unopened property is an example of Ms Brown's failure "to engage with the public". He added: "In light of the above please tell us why UKIP in north Wales and the party locally should not seek to apply to the NEC [National Executive Committee] to deselect you and for the party to investigate the serious misconduct, which you have displayed." Some of these issues are not just limited to Michelle Brown. My regional UKIP AM also appears to be shy. She has reportedly taken over my old constituency office but, nearly a year after she was elected, it was empty last time I went past. At the time of writing she does not list a constituency office nor any surgeries on her website, nor is a constituency office listed on the Assembly website and she remains mostly anonymous in the local media. Is foreign money threatening the UK's democratic processes? With the controversy over Russian interference in the US Presidential race raging and with many more revelations expected it is only natural that we should be asking could the same thing happen here. Well, according to a working group set up by the London School of Economics such interference is not only possible but we may not have sufficiently robust structures in place to stop it. According to the Guardian they have warned that new technology has disrupted British politics to such an extent that current laws are unable to ensure a free and fair election or control the influence of money in politics. Its policy brief published on Saturday concludes that current laws can no longer ensure the fundamental principle of a “level playing field”, or guard against foreign influence, and that parliament urgently needs to review UK electoral law. The Electoral Commission is investigating whether work that the data analytics firm Cambridge Analytica may have done for Leave.eu constitutes an undeclared donation from an impermissible foreign donor. Cambridge Analytica is majority owned by the hedge fund billionaire Robert Mercer, who bankrolled Donald Trump. Filings from the White House disclosed on Friday that Steve Bannon, Donald Trump’s strategy chief, was paid $125,333 by the firm last year. Unless the Electoral Commission is given the resources to tackle these threats and the power to impose realistic penalties and unless regulation is updated to meet changes in new technology then our democracy could face an existential crisis if it is not already in the middle of one. Is the future of Gibraltar back in the mix due to Brexit? As talks get underway on the terms of the UK's exit from the European Union, it seems that it is not just the future of the union is at stake. According to the BBC, Conservative MPs are concerned that Spain could potentially veto a UK trade deal with the EU if it does not get a say over the future of Gibraltar. Who knew? Well actually, the remain campaign were warning that this very problem would arise from a leave vote. So why are the Tory Brexiteers so surprised? Spain has long contested Britain's 300 year-rule of Gibraltar but Gibraltarians rejected the idea of the UK sharing control with Spain in a vote in 2002. In a referendum, the approximately 30,000 residents of "The Rock" voted by 99% to 1% to reject the concept of dual sovereignty. However, this did not put an end to the issue, with Spain continuing to press its territorial claim and periodic incidents heightening tensions between the two countries. In the wake of June's referendum - in which Gibraltar voted by a margin of 96% to 4% to remain in the EU - Spain's then foreign minister José Manuel García-Margallo suggested shared sovereignty could allow Gibraltarians to maintain some of the benefits of EU membership and enable Spain to "plant its flag" there. The BBC adds that in its draft Brexit negotiating guidelines, which have yet to be approved by all member states, the European Council identified future arrangements for Gibraltar as one of its 26 core principles. It wrote: "After the UK leaves the union, no agreement between the EU and the UK may apply to the territory of Gibraltar without agreement between Spain and the UK." The Brexiteers released the furies, it is only now that they are beginning to understand the consequences.